Muslim advocates expressed concern about CIA Director Mike Pompeo’s words after the Boston Marathon bombing. 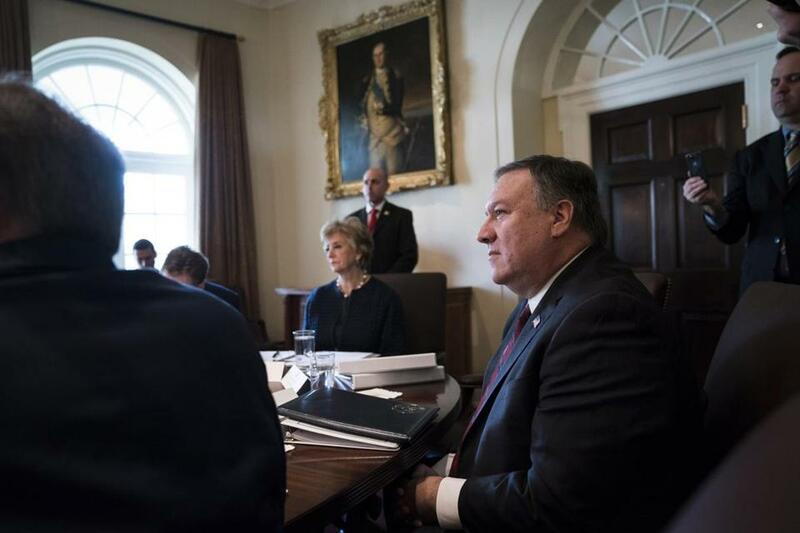 WASHINGTON — Mike Pompeo, President Trump’s new nominee for secretary of state, quickly came under scrutiny Tuesday as critics pointed to remarks he made after the Boston Marathon bombings as proof that he holds anti-Muslim views. The comments could become one of several flash points in what is shaping up to be a contentious nomination fight, further complicating Trump’s latest effort to remake his administration. Two months after the Marathon bombings, Pompeo, then a House member from Kansas, delivered a speech saying that Muslim religious leaders were “potentially complicit” in the terrorist attacks because they had not forcefully condemned the bombing. “Every Muslim leader must unequivocally proclaim that terror committed in the name of Islam violates the core tenets of the Prophet Mohammed. And they must do so repeatedly. Period,” Pompeo said during a five-minute speech on the House floor. President Trump unceremoniously dumped Secretary of State Rex Tillerson — by tweet — escalating the administration’s chaotic second-year shake-up. Read: Who is Mike Pompeo? The comments resurfaced on Tuesday as Pompeo prepares for Senate confirmation hearings for the Cabinet’s most prominent position, a process in which senators will probe his world view and his approach to international diplomacy. Senator Edward Markey, a Massachusetts Democrat who sits on the Senate Foreign Relations Committee, said he plans to ask Pompeo about his 2013 statements. Pompeo was selected to replace the outgoing Rex Tillerson, whom Trump fired Tuesday morning in a tweet. Pompeo’s nomination continues his extraordinary ascension from the back benches of Congress to the height of the world stage in the Trump administration. A former Army officer who graduated with a degree from Harvard Law School in 1994, Pompeo did not enter federal politics until 2010, when he swept into Congress as part of the conservative Tea Party movement that arose after President Obama’s historic election. Pompeo rapidly earned conservative credentials serving on the House Select Committee on Benghazi, which became embroiled in a two-year investigation of the attack by Libyan militants on a US consulate in Benghazi and former secretary of state Hillary Clinton’s response. After Trump’s victory, Pompeo was nominated as CIA director and developed a close working relationship with the president, which led to monthslong speculation that Trump would replace Tillerson with him. “I have gotten to know Mike very well over the past 14 months, and I am confident he is the right person for the job at this critical juncture,” the president said. Muslim advocates were unequivocal that Pompeo’s assertion regarding the Boston Marathon was false — and that many Muslim leaders condemned the attacks at the time. The executive director of Boston’s largest mosque, for example, said after the bombings that he was “infuriated” by the criminals’ actions and did not recognize them as a part of the Muslim faith. The national chapter of the Council on American Islamic Relations, or CAIR, also held a press conference in 2013 to immediately condemn the attacks. On Tuesday, Muslim advocates said Pompeo’s mischaracterizations should give every senator pause for confirming him. Scott Simpson, public advocacy director for the Washington-based civil rights group Muslim Advocates, questioned Tuesday why Pompeo expected Muslims to condemn violence they had nothing to do with. “This is not someone who has taken reasonable positions on Muslims; this is someone who has decided to really use offensive and divisive rhetoric,” Simpson said. Asked for a response to the criticism of his 2013 comments, a CIA spokeswoman pointed to his responses affirming a commitment to a diverse workforce during his confirmation hearings last year. Pompeo will likely face a much tougher confirmation process than he did a year ago. Democrats and Muslim leaders alike raised concerns when he was nominated for the CIA, but those are now heightened as Pompeo potentially takes on a much more high-stakes and public role in which he would regularly deal with leaders from Muslim countries. Fourteen Democrats voted for Pompeo for CIA director in January 2017, including minority leader Chuck Schumer of New York. However, several of those senators said they were unsure if they would vote for Pompeo again. “I’m giving him a new look because the CIA director has virtually no policy responsibilities, and as secretary of state he’ll have responsibility in a lot of areas,” said Senator Sheldon Whitehouse, a Democrat from Rhode Island. Schumer told reporters Tuesday he is not urging his caucus to vote against Pompeo at this time but has concerns about how Pompeo has handled the threat of Russian election meddling. Markey and Warren voted against him as CIA director. Democrats are also angry about Tillerson’s proposed cuts to the State Department during a time of tense geopolitical conflict in North Korea and elsewhere and will question Pompeo closely about whether he will continue that effort. But at least one Democrat sounded positive about the pick Tuesday — Senator Joe Manchin of deep-red West Virginia. Manchin has voted for several of Trump’s most contentious Cabinet picks, including Attorney General Jeff Sessions, and with such razor thin margins in the Senate he could seal Pompeo’s confirmation if he crosses party lines again. “He’s well-spoken, very candid, and very straightforward,” Manchin said of Pompeo. Republicans sounded unanimously positive about Pompeo, even as they bemoaned the unceremonious way Trump fired Tillerson. 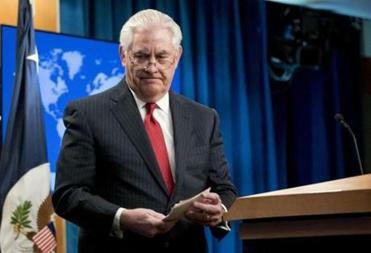 Republican Senator Bob Corker of Tennessee, who once said Tillerson was one of the only things standing between the United States and a Trump-induced “chaos,” was less effusive. “I had a very good conversation with Director Pompeo this morning and look forward to meeting with him soon,” said Corker, the chairman of the Senate Foreign Relations Committee. Astead W. Herndon can be reached at astead.herndon@globe.com. Follow him on Twitter @AsteadWesley. Liz Goodwin can be reached atelizabeth.goodwin@globe.com. Follow her on Twitter @lizcgoodwin.